ups: Awesome graphics, great online fighting. Fighting as one of earth\'s most deadly weapons, an elite marine in the Rhino Squad, Matthew Kane has to battle through the defenses and fortifications of the Strogg home world Stroggos. Quake 4 picks up right after the ending of Quake 2 (your feats of valor in Quake 2 are even referenced in the opening cutscene), and offers a first-person experience that is full of twists and turns as you battle through corridors and open terrain against the brutal and vicious Strogg. The ability to pilot walkers and tanks as you try to defeat the enemy in open ground combat is a new twist in the series that will have you smiling big. The story and action sequences are very straight forward throughout Quake IV; regular gamers will easily conquer the game in around ten hours. Now this isn\'t to say that Quake 4 is a walk in the park: You will face many parts of the game where the level bosses just take you to school; however, it is still your basic run of the mill shooter. From the start, Quake IV immediately reminded me of Doom 3, whic is no surprise, but the engine has been tweaked and enhanced to enable visuals that surpassed the quality and clarity that Doom 3 brought to the mix. I really enjoyed the outdoors missions that Quake 4 offers, to be honest, I\'m tired of crawling around corridors and abandoned science facilities. I was impressed by the visuals of this game, and the fact that the assault rifle and pistol actually have flashlights. However, Quake IV is very straight forward and I sometimes felt like I was running through a rat maze. One door would close, another would open right beside you, essentially guiding you through the levels and missions without much in the way of \"options,\" just like so many of the other FPS titles currently available. The enemy AI in Quake IV is very basic, you get some borgs jumping form side to side, but mostly you\'ll get the standing and shooting kind or the crazed charge at you with a grenade launcher type. This makes for some very fast twitch gaming, but not exactly the most strategic fragging. Your friendly AI, on the other hand, is a lot more than I expected. As you fight further and further into the game, you get marines that fight in scripted battles as you pass by. Sometimes you are accompanied by a teammate or two who can heal you or repair your armor. I was really surprised at the damage these guys could take, sometimes much more than you yourself, and they deal more damage than the typical grunt. I really liked having these comrades in battle in comparison to the solo creeping around of Doom. Another cool feature of Quake IV is the ability to upgrade your weapons as the game progresses. Everything from homing abilities, to extended clips, or ricocheting bullets can be added to your weapons. These enhancements are cool and well-needed as the game progressed. Close to a third of the way through the game you\'re thrown a curve ball, a series of events takes place meant to completely turn the game on its head. However, although the twist is a cool concept, in the gameplay it only means a bit of extra life and some abilities to better blend into and utilize the environment. I thought there would be some heavy sneaking around undetected or discovering of new things, but the overall game play changes very little. The audio in Quake IV is superb if you have a surround sound system that can handle the ground shaking weapons fire. As the battle rages on around you, the cacaphony of human-alien war intensifies already action-packed gameplay. And inside levels sound just plain creepy (when everything isn\'t drowned in the sound of raging hellfire). The voice acting is also up to par with the rest of the FPS games out there. The multiplayer in Quake IV is incredibly fun. It\'s the bread and butter of what this series has been about. The graphics and maps have all obviously been enhanced, with the reworking of some classic maps (including the Longest Yard, one of my favorites), and a new system of setting up 1 on 1 tournaments. In total there are nine deathmatch maps available, with the support for team deathmatch on each one. There are also five capture the flag arenas that are laid out really well with the exception of one winding corridor map that is a total bore. 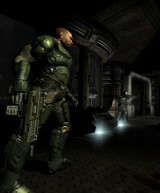 When you play Quake 4, and most gamers should/will, you must realize that this game is nothing new or genre defining. A lot of people will be disappointed with the single player story, as it seems it\'s years behind the current crop of FPS games. But the multiplayer will bring a big grin to your face as you battle through the tried and true game play of online frag-fests. When it comes down to it, Quake 4 will definitely stay on my machine for the coming months.